Sorry my promised review is late, but I have finals coming soon and my light and cell phone camera were being b*tches to me. Anyway, here it comes! My review of Aube's new eyeshadow palette in purple! The picture is still not perfect, but the best I could manage. :( The colours are more vibrant in reality, but the sparkle comes out pretty nicely. The sparkly area on the left is the white base colour. I applied both the brighter and the darker lilac on it and on my naked skin (right side.) I think you can see a slight difference. 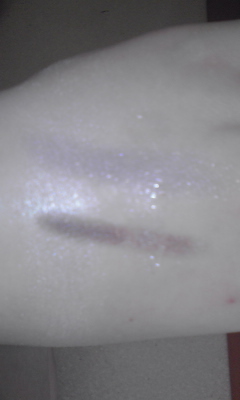 The sparkle area on the right is the glitter pigment (the little dot in the palette.) It does sparkle quite a bit, but is still not overdone and makes you look like a disco ball or something trashy. The colours go on effortlessly with the applicators that come with the palette. They give a nice wash of colour, but still look sheer. Overall, I think it's a really classy palette. I don't own any purple clothing, but the nice lady at Ainz&Tulpe tried out every colour on me and purple looked the best. (I have hazel eyes.) Well, this is a nice contrast to my white and blue outfits I wear quite a lot in summer.